Life in Hawaii is never dull. When I’m visiting elsewhere, people ask me, “Don’t you get Island fever? Don’t you get bored?” How can I get bored when I’ve only been home on Maui for three days, yet we’ve already had a major storm warning, in which they closed the Port, which had us buying bottled water, filling every pot, pitcher and cake pan in the house… battening down the hatches, and praying it would pass over? There’s no time to be bored. We live on a rock on the middle of the Pacific ocean, and it’s wild and woolly here. Locals get a little panicked when they think the boats won’t come in and they’re going to run out of rice, water, or toilet paper. And and of all of those things, let me tell you, toilet paper is the biggie here! We went to Safeway and there was not a single bottle of water left on the shelves. And the lines to fill the cars with gas at Costco were ten-deep. We have a weather/emergency radio that runs on batteries, and has a handy-dandy wind-up up cell phone charger built in. (Not that the cell phone towers were actually functioning during our last earthquake, but still, I sleep better having it.) Yesterday we turned on that radio, and there was a recorded, monotone, mildly ominous voice warning, “Turn around, don’t drown.” It was referring to the swollen creeks and streams on Maui, and the people who unthinkingly cross them. For anyone who has driven to Hana on that narrow, winding road, just picture the creeks rushing over it while trying to navigate those wild hair-pin turns. I have lived here since 1999, and there’s not been a time that we’ve put the work in and prepared for a big storm, hurricane, or tsunami in this fashion, and actually had all the bad stuff come to fruition. But you have to prepare…better safe than sorry. Bored? There’s no time to be bored. Fires that close the only road into Lahaina. Floods. Pestilence, hurricanes, tsunamis… we have it all. They burned the sugarcane field right behind our house the week before I got home. This is the only time that this has occured, that I’ve been gone for the burning. I was overjoyed. Then it was time for the cleanup, to get all the greasy ash off of everything that floated in the air during and after the burn, and coated the driveway, garage floor, porch and porch furniture. Mike had just finished pressure-washing the back porch, when the storm warnings arrived. Now, we have nice, clean air because the storm blew out all of the cane-smoke. And we are never bored. A hui hou! If you’d like to subscribe to this blog, please click the “Follow” button on the homepage. Thanks for reading along. 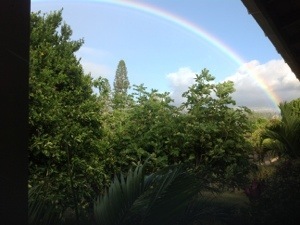 The stunning rainbow off the front porch. And, another pair of rubbah slippahs (rubber slippers) bites the dust to the Maui mold and humidity. Half the bottom simply crumbled away when I put them on. They had barely been worn.